During ITMA ASIA 2018 in Shanghai, the Neuenhauser Textile Division is represented at two joint booth. One in the spinning hall (H1D37) with Sohler-Neuenhauser, Neuenhauser Automation, and Neuenhauser Rosink. The second joint booth located in weaving hall (H3C20) is represented by Neuenhauser Winding Technology, Scholze and Genkinger. All companies will be supported by their Chinese subsidiary Neuenhauser Technology (Suzhou) Co., Ltd. Especially under the topic Industry 4.0, the Neuenhauser Textile Division introduces at the ITMA ASIA its wide range of products for automatic handling, transport, packing and service machines in spinning mills. In the weaving area the Group members demonstrate the latest developments in off- loom fabric winding technology and material handling for weaving mills. Scholze Germany is represented on the weaving booth as manufacturer of warp beams, back beams and cloth beams. As a specialist in this field Scholze is a supplier for all established weaving machine manufactures. Genkinger shows the logistic task to mastering the handling of a warp beam in a weaving mill. The exhibit shows an electro-hydraulic vehicle to handle a warp-beam. The vehicle is equipped with the latest control technology and longlife batteries, like all other products from Genkinger. 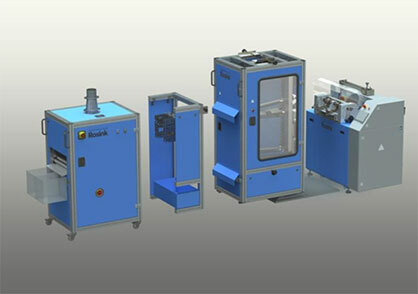 Neuenhauser Winding Technology shows the latest model of the MultiWinder series. Additional the latest developments in Center winding for usage in the areas technical textiles and carbon fabrics will be presented. 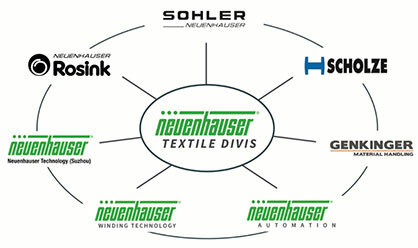 State of the Art in the most weaving and spinning mills are cleaning systems, which are offered by Sohler-Neuenhauser. Together with their roving bobbin transport system “RA” for spinning mills with different degrees of automation, Sohler-Neuenhauser is a perfect partner for modern weaving and spinning mills. 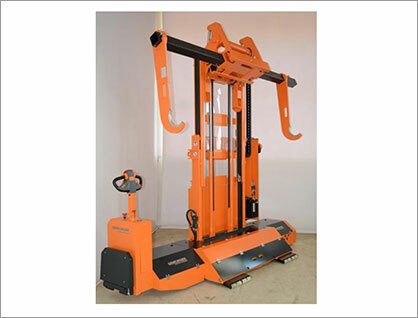 Neuenhauser Automation presents a fully automatically palletizing system, including tube colour detecting system. This exhibit shows a selection of the complete range of automatization products for logistic and packing-relevant tasks in the modern spinning mill, which are offered by Neuenhauser Automation. Neuenhauser Rosink presents their newest development, a fully automatic cot grinding machine, Type SZ2A. This new development is an expansion of the existing product range from Rosink which consist of service machinery for spinning mills and sliver and ribbon production. The Neuenhauser Group is operating world-wide and has sales agents in more than 90 countries. The close working method of the group members is one of the greatest benefits for our customers. Synergies and optimal service by numerous product technicians, who are based in various countries, is the result of the close cooperation of the Neuenhauser Textile Division group members.